Sounding EXACTLY like a bad rotor or cap, the engine began missing. It also died whenever approaching an intersection. Although it started fine and ran well when moving, the idle speed fell. All that's involved is to remove the choke plate and rod, remove two screws on a cluster just inside the mouth of the carb and remove it. When I took mine out, one of the two idle tubes remained behind indicating it had fallen out. I ran a small piece of wire through them to clean them both out and remounted both. Once things were bolted back together, everything was back to normal. I wish I would have had the presence of mind to take a bunch of photos. That will have to wait until next time. The Jeep 258 (4.2L) I6 isn't a power house, but it has gobs of low RPM torque that makes it a great engine off-road. The most common problem I see with the engine is it's inability to idle. Between the 258 in my '81 CJ-7 and a couple friends that have 258 equipped Wranglers, I have fixed this problem half a dozen times and the cause of the problem has always been the same. The problem has always been caused by clogged idle tubes that cause fuel to drip out of the venturis and make the Jeep run rich at idle. Fixing the problem is relatively easy and once you get past this problem, you will get much more enjoyment from the 258 and the Carter BBD carburetor. The Carter BBD is a two barrel carburetor that was available on late 70s to late 80s Jeeps with the 4.2L engine. There are two variations of the carburetor, one is computer controlled and has a stepper motor on the back side. The computer controlled version was used after 1981. Other than that, the two versions are the same although it seems the stepper motor version is a bit more troublesome. For a sure diagnosis, park the Jeep with the engine off and remove the air cleaner cover. There should be a plate over the throat of the carb, the choke plate. If you open the choke plate you should be able to see down the throat of the carb and you should see two screws with holes in the middle of them. Next to them are two passages with a nozzle in the middle of each. This thing is known as the venturi, when air passes by, fuel is supposed to be drawn out through the nozzles. If the idle tubes are clogged fuel will drip from those nozzles during idle. In order to see if fuel drips from the nozzles at idle, you must start your Jeep with the air cleaner cover off and look down the throat of the carb. The Jeep Technical Service Manual recommends that, when you do this, you cover the air cleaner with a piece of plexiglass since the engine can backfire through the carb and a flame can shoot out. Since I am reckless and like living dangerously, I never do this. After you have chosen the wise or foolish path, start your Jeep and open the choke plate. If your idle tubes are badly clogged, you will see fuel dripping from the nozzles at idle (if your Jeep will idle at all.) If you don't see fuel dripping, but your idle is still poor, open the throttle a bit with your hand or have a friend hit the accelerator. You should see two even streams of fuel and no dripping from the nozzles. Any dripping means clogged idle tubes. While you are doing this, make sure you don't put your hand or anything else into rotating parts like the fan. Keep your tie away from that thing (some people just want to look good all the time.) Same goes if you are a "long hair, freaky" Tesla type. All joking aside, I've heard some bad stories. Remove the air cleaner cover and air cleaner. You may need to remove a few hoses and wires to get the air cleaner out of the way. Make sure you tag them all so you can put them back in the right spot. It's often easiest not to remove the heater hose that goes to the exhaust manifold, if you have one. Remove hoop that holds air cleaner. Remove the two screws holding the choke plate with a 3/16" socket or small flat blade screw driver depending on what screws you have holding it. Be careful not to drop the screws down the manifold unless you enjoy fishing. Remove the choke plate. If your carb has one, remove the plate on the side that covers the choke linkage so you can access the screw holding the choke rod. It may be necessary to drill out a rivet to get it free. Remove the little snap ring and screw (1/4" socket) that holds the rod that holds the choke plate and remove the rod. A screw driver will normally push off the snap ring. Remove the two screws with holes in the middle of them and carefully remove the venturi cluster with the two little gaskets. There should be two idle pickup tubes pushed into the venturi sticking out of the bottom. If they have fallen out, that could cause your idle problem. Blast the venturi and inside of carb with lots of carb cleaner. Be sure not to dislodge the check ball in the center. With a long thin pin or piece of piano wire, make sure the idle tubes and nozzles are clear. After you have run them through, spray with more carb cleaner. Put the cleaned out venturi cluster back with the two gaskets and two screws. Replace the choke rod with snap ring and screw and replace the choke plate. Make sure all the screws are tight that hold together the carb body at this time. Often the screws will loosen up and dirt will be sucked into the carb. Replace the plate covering the choke linkage with a sheet metal screw, or leave it off. Smooth idle should have returned after this simple process. If you still have idle problems and don't have any dripping, make sure all the vacuum hoses are hooked up and in good shape. Also check for leaks around the intake manifold or a loose carburetor. To avoid repeated clogged idle tubes, drill out the idle tubes to 0.032". This will greatly reduce the frequency of clogging and it is a procedure that was actually recommended by Jeep for a while. An alternative to removing the choke plate and all is to just remove the top of the carburetor. The advantage of this approach is you can make sure there isn't a lot of junk in the bowls, you can check your float adjustment, etc. 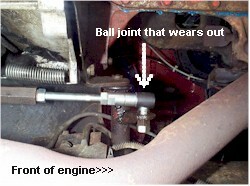 It also may help if you have power brakes because the master cylinder may be in the way of getting the choke rod out. Thanks to Randy Peterson for posting this solution a few years back. I've used it on various Jeeps many times since. While adjusting the parking brake shortly after buying the Jeep, I noticed the clutch fork boot was pulled out on one end. God must watch Jeepers. As I pushed the boot back, the lower clutch rod hit me in the head. It just fell out. Research showed that the rod will often wear at its forward pivot point to the point that the rod separates from the pivot. If the outer return spring is not in place, the rod is free to fall out. Even with the spring in place, rock crawling will often twist the vehicle in such a way that there isn't enough pressure to hold the rod in. They said that you were often lucky to find the rod. The fix was easy. A call to 4WD Hardware brought a new lower clutch rod and a new spring. The hard part was figuring out where the spring went. The original was long gone. Luckily, some net-help showed its proper location.